Traffic engineering means traffic shaping and policing. In case of MPLS we may choose the exact path, we may also allocate required bandwith to the appropriate flow and set up priority. For allocation of the bandwith responsible is RSVP-TE protocol. This flow may be any critical service like VoIP that is highly important for us. 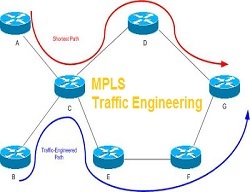 MPLS traffic engineering employs “constraint-based routing,” in which the path for a traffic flow is the shortest path that meets the resource requirements (constraints) of the traffic flow. In MPLS traffic engineering, the flow has bandwidth requirements, media requirements, a priority versus other flows. Protocol responsible for path calculation is called CSPF (Constrained-Based Shortest Path). We may also use explicitly configured path in 2 modes Strict (the flow has to pass through ALL routers) and Loose (the flow has to pass through the pointed routers and the others). MPLS traffic engineering uses well known logical tunnels, the concept also used in GRE. Tunnels are uni-directional, what means the return traffic may goes back through different tunnel or even not through any tunnel, but just MPLS. Let’s take the other lab from this topic http://itbundle.net/archives/4496, modify its slightly and based on its, deploy traffic engineering. As you see I added another router R1 in MPLS core. From now on the traffic from Customer-A1 to Customer-A2 will be going through R1 becasue OSPF has calculated properly that this is the low cost path. We will implement MPLS-TE in 3 steps. 1. Enable OSPF (Area0) to support MPLS-TE on EACH router in MPLS core. Router ID has to be loopback of given router. Firstly we enforce the traffic to go through the desirable path R2-R3-R4-R5 from Headend-R2 and respectively R2-R3-R4-R5 from Tailend-R5. To that end we have to create the list with the next hops.We will use this “list” later under tunnel configuration. Now we create the tunnel. We may “borrow” the ip address from loopback interface. “Tunnel destination” is always loopback address of the second site. Next we run traffic engineering on the “interface tunnel” and allocate bandwith. The last 2 lines are the most interesting.”tunnel mpls traffic-eng autoroute announce” states that we want our tunnel takes part in IGP OSPF Shortest Path First calculation process, because logical tunnel is considered as peer to peer link (despite leads through 2 routers), will win over other paths that are going through the at least one router (R1). In the last line we set up “path options”. We have only the one option, but we could have more, then we add another line “tunnel mpls traffic-eng path-option 2” and so on. In our case we use “explicit” path calculation (the other option is “dynamic” when we lat MPLS-TE calculation of the best path) and we point out the list with next hop addresses. How important is command “autoroute announce” we may check if we use its and when remove from configuration. We see that without this command the next hop for route 5.5.5.5 is 10.0.21.1, with we have p2p tunnel.